This new multivitamin formulation probably epitomises the very best that nutritional supplementation offers in the way of prevention, protection and therapeutic potential. Daily 2® has a particular and significant advantage: its galenic formulation means that all its active principles are released over a prolonged period. As a result of ground-breaking technology, this supplement is able to both mimic the natural production and supply of micronutrients (thus preventing the peak plasma concentrations which are often associated with mild side-effects), and maximise micronutrient absorption (especially that of water-soluble vitamins which have to be delivered to the body in small amounts). Who is Daily 2® aimed at? The multivitamin supplement Daily 2® is ideal for meeting the needs represented by the first level of the SuperSmart nutritional pyramid, and offers a useful alternative for regular users of Daily 3® or Daily 6®, two other benchmark multivitamin supplements. It’s an excellent formulation for ensuring a minimum daily intake of micronutrients: all the vitamins and minerals included have been selected for their clinical validity, as well as their optimal bioavailability and absorption. This formulation contains no less than 32 ingredients, all of which are naturally free from artificial colours, preservatives and known allergens (dairy, fish, eggs, gluten, yeast, soya …). Daily 2® constitutes a ‘must-take’ nutritional supplement. those with an unhealthy diet. 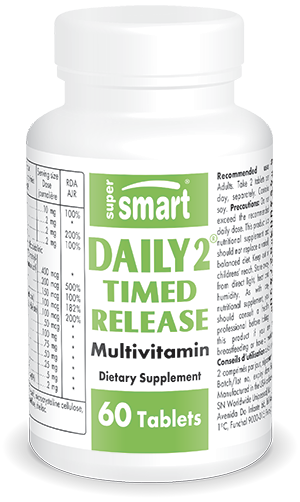 What benefits are provided by the multivitamin formulation Daily 2®? It goes without saying that, together, these benefits produce improvements in general health, reduce the risk of numerous diseases, and combat ageing, as a result of its high quality antioxidants (bioflavonoids, pyrroloquinoleine quinone). Intake of vitamins and micronutrients has fallen dramatically in modern societies. A study has shown that only 4% of Western populations actually consume the 5 portions of fruit and vegetables a day recommended by government health authorities. And this situation looks set to deteriorate further over the coming years as there’s a strongly negative generational effect: those in their twenties and thirties may be eating as little as eight times fewer fruits and vegetables than their parents did at the same age! The micronutrient content of food has been in constant decline since the last century. Researchers have estimated the loss of calcium, iron, vitamin B2 and vitamin C to be around 30% over the last 50 years. Among the factors responsible are the misuse of pesticides, impoverished soil, the selection of ever-more resistant but less nutritious varieties and the fact that foodstuffs are in transit for days before being stored. Today’s foods are full of useless substances that impair the body’s functions. To make foods more appealing and resistant to pests, diseases, climate and the passage of time, manufacturers bombard their products with substances that directly or indirectly contribute to the onset of various diseases (cardiovascular, neurodegenerative, auto-immune, cancer, allergies …) as well as oxidative stress. To combat these effects, there’s only one reliable solution: consume as many natural antioxidants as possible. Countries in the West are facing an onslaught of ‘new’ diseases and conditions such as diabetes, obesity, auto-immune and neurodegenerative diseases. These are all linked, directly or indirectly, to our new dietary habits. But in addition to reducing the risk factors for these diseases, Daily 2® enhances every aspect of our health (it helps restore energy, and supports development, physical ability, good quality sleep, optimal use of nutrients …), re-establishing a virtuous circle. As a result of its prolonged release mechanism, Daily 2® delivers its vitamins and micronutrients all day long. This continuous delivery corresponds more closely to natural intake than is the case with standard multivitamins. 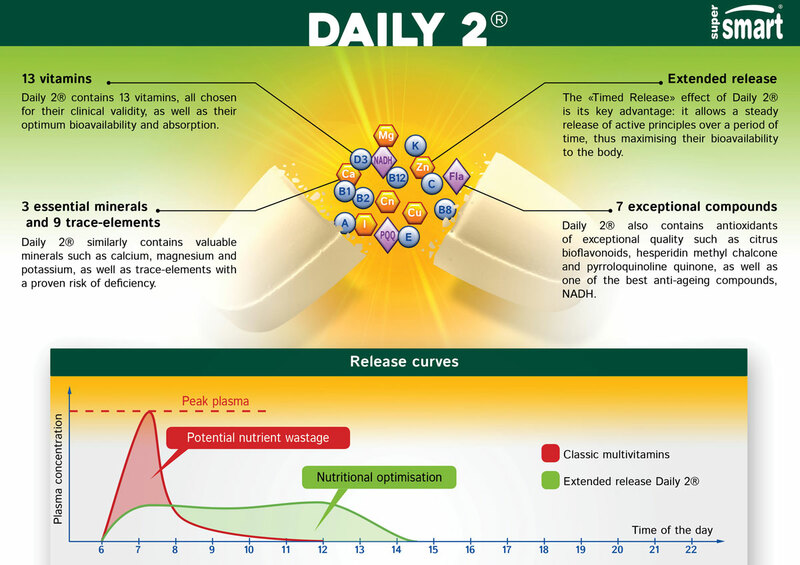 How have the various forms of vitamins in Daily 2® been selected? The vitamin E complex comprises all tocopherols and their isomers while Vitamin A is included with its carotene precursors: the alpha and beta carotenoids, as well as lutein, zeaxanthin and beta-cryptoxanthin (most multivitamins offer synthetic beta-carotene only). Vitamins K1 and K2 (menaquinone 7) help boost blood coagulation and bone metabolism. Particular attention has been paid to the form of folic acid chosen: unlike most available folic acid, the form in Daily 2® is metabolically-active (metafolin L5 methyltetrahydrofolate) and is thus better absorbed and directly usable by individuals with methylenetetrahydro-folate-reductase (MTHFR) polymorphism. The choice of vitamin B12 – methylcobalamine - is a particularly safe form of a nutrient that is recognised for being hard to absorb when taken orally. As you might expect, this formulation contains vitamin D3, hailed as the new panacea. The 600IU provided per tablet will, at the daily dose suggested, boost levels to the amounts needed to ensure healthy bones and will provide multi-faceted protection against cancer, a property extensively studied in recent years. Which other elements make this formulation so exceptional? The minerals and trace elements all have verified bioavailability and validity. Produced using the patented Albion Process (the gold standard), all the amino acid chelates have low molecular weight which helps ensure exceptional tolerance and bioavailability. It contains the complex calcium citrate malate which has been widely studied for its efficacy and excellent absorption. Chromium and organic vanadium have also been included for their physiological activity, widely demonstrated in a number of metabolic and inflammatory disorders such as type 2 diabetes and obesity. It is also worth mentioning the addition of rare elements such as NADH, R-alpha-lipoic acid and PQQ, all of which feature in SuperSmart’s extensive anti-ageing range, of which the most popular supplement is probably Longevity Nutrients. What benefits are offered by the prolonged release aspect of Daily 2®? The key advantage of Daily 2® is its ‘Timed Release’: a galenic form which enables the supplement’s active principles to be continually released over time . How does this work? It is based on slower than normal release of the active principle. Instead of the micronutrients being delivered in one go, they are discharged from the tablets over an extended period and thus the active principles are dissolved and absorbed over time. The active principles are carefully blended with a gelling agent called hydroxypropyl methylcellulose (a plant-source alternative to the much-decried pork gelatine). Once ingested, the tablet starts to swell as the gelling polymer comes into contact with digestive fluids and hydrates: a gel-like barrier forms and prevents the active principles, trapped in the matrix, from being released quickly. To break free, they have to wait until water slowly permeates the gel, enabling it to dissolve and the active principles to be released into the digestive system. This can take time as fluid enters and leaves the matrix slowly, while the matrix crosses the gastrointestinal tract without disintegrating (though it can partly erode over time): the active principles are thus released and become bio-available gradually , without the body ever having to deal with a massive influx of micronutrients that it is unable to fully digest. The interval between the polymer hydrating to form the viscous layer which traps the active principles can be several minutes long and some of the principles on the surface of the tablet may thus dissolve before this happens. To prevent this, Daily 2® uses the properties of another compound, cyclodextrin (a natural-source ‘carrier’ molecule) which slows down the solubility of the active principles, particularly that of water-soluble vitamins. there is optimal absorption of micronutrients (and therefore less nutritional ‘wastage’). Nowadays, we know that diet plays a fundamental role in our chances of developing chronic and degenerative diseases (diabetes, cardiovascular diseases, cancer, obesity, allergies ...). Unfortunately, just as our understanding of the role and synergy of dietary nutrients is reaching new heights, our diet is plumbing new depths. A paradox which underlines the importance of the multivitamin supplement Daily 2® and its sister products Daily 3® and Daily 6®. With its exceptional mode of delivery and scientifically-supported composition, Daily 2® thus constitutes a ‘must-take’ nutritional supplement, indeed, it’s probably one of the best multivitamins available. It is one of the few ways compatible with modern life of optimally and easily fulfilling our nutritional needs. This vitamin complex should not be used as a substitute for a varied, balanced diet and a healthy lifestyle. It’s important to follow the guidelines on how to take it and the recommended dose, and to use it by the ‘best before’ date. It is not recommended for women who are pregnant or breastfeeding, or for children under 15. Keep out of children’s reach. Store in a cool, dry place.